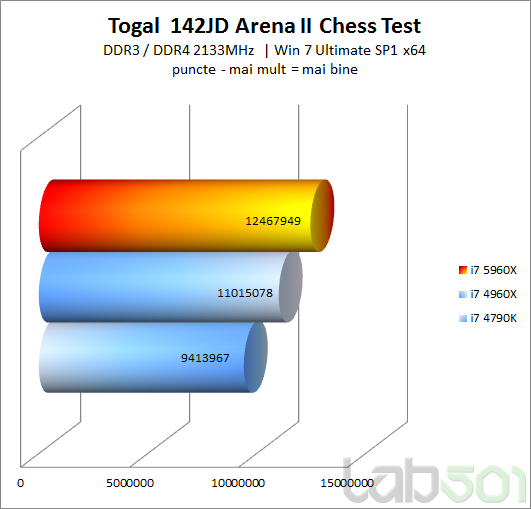 The new Haswell-E 8-Core i7-5960x provides a nice speed bump in chess. At stock speed, it already performs close to the Xeon E5-2687W v2. Cool. What is the leader CPU for notebooks? @Gurcan Uckardes wrote: Cool. What is the leader CPU for notebooks? wooow what a beautiful monster! TECHSPOT wrote: Like every Extreme Edition processor before it, the 5960X is aimed at people who will spend whatever Intel is asking for just to have the fastest system possible. Pros: With eight cores, a 20MB L3 cache, 40 PCIe 3.0 lanes, DDR4 support, decent overclocking and Intel's new X99 chipset, the Core i7-5960X is destined for dream machines. Cons: It doesn't offer much of an advantage over mainstream chips for gaming and in scenarios where there is a solid speed boost, at $1,050 you'll be paying a largely disproportionate premium for it. Hard to deny that 5960X is obviously the extreme. But looking at the high TDP, relatively low maximum working temp and the sky high price to finance Intel R&D, i would still pay (way less) for a 4712HQ on a notebook and carry the engines everywhere i go. I wouldn't reject a 5960X PC as a birthday gift though. But where are such caring relatives? 28351 is when HT is Enabled of course. There are definite risks that you are taking when you decide to overclock your system processor. There is much debate over what the risks are, ranging from "don't worry, be happy" attitudes from many hackers to those who think overclocking is very dangerous (I guess I'm close to being in that category, although I think it is reasonable in some circumstances). I hope to list here the dangers but with a reasonable indication of how likely they are, and really I don't think I'm going off the deep end with any of this stuff. Here are the possible outcomes you can expect when you overclock your processor. These apply to raising the clock speed of the processor only, if you are changing the system bus speed above its nominal rating you will need to read here as well. Success : The processor may overclock perfectly, and run stably for many years to come. There are thousands of people who have done this, and I am certainly not going to deny it. This is the best case outcome. Non-Functionality : The processor may not work at the new speed, but may work fine when returned to its original speed. This is a fairly common outcome when overclocking, and in most cases the processor will not be any the worse for wear. System Instability: The processor may boot at the new speed, but you may see the system behave strangely. Random hard lockups, parity errors, resource conflicts, strange hard disk problems, beeping, application crashes and Windows refusing to boot are just the tip of the iceberg. Particularly insidious are the overclocks that work almost perfectly, because that occasional crash may be due to your operating system, but it may be due to that overclocked chip also. Data Loss : It is very possible to lose data as a result of overclocking. If the processor is not functioning properly, you risk potentially damaging the structures of your hard disk's file system. It is also not uncommon for the Windows registry files to become corrupted, requiring a complete Windows reinstall. Needless to say, a full backup before overclocking is a wise move. Electromigration : When the processor is run at a speed that is higher than it is supposed to be run at, there is a chance that the internal components in the processor may break down over time. The internal features of a CPU are sized in the range of microns. It is possible that when the processor is stressed by running at too high a frequency, along with the extra heat that overclocking incurs, that the actual metal lines inside the processor may form shorts or opens and damage the processor over a period of time. How likely this is to happen, and how long it takes is really not known. The system may work fine for a while and then suddenly stop working. Also consider that hardware is not static; it ages, it changes over time--and it degrades over time. Even if overclocking works today, it may be working because you are just within the limits of what the system can handle. This doesn't mean that in six months or a year, changes in the hardware due to aging, heat or other stress factors won't cause failures or strange behavior to crop up. There is no magical formula for finding the right combination of overclocking speed, choice of cpu, and plethora of cooling components; balance comes through rigorous trial and error and sometimes worst case scenarios. Many of the overclocking forums you read about on the web only show you the "successful" side. This article is reference for those interested in attempting to overclock their cpus. Be prepared for the above, but most importantly...have fun what you are doing. I agree. If you want to overclock and you are aware of the risks then it's your choice. © Copyright 1997-2004 Charles M. Kozierok. All Rights Reserved. Overclocking is popular today in large part due to the fact that modern PC circuitry makes it easy to do. You have motherboards with variable clock speeds on them and processors that respond to signals from the motherboard telling them how fast to run. It wasn't always this way, but overclocking on PCs has in fact been done for over 10 years. On other small microcomputers it goes back over 20 years! On the PC, overclocking probably goes back to the original IBM AT, which used the Intel 80286 processor. There were two versions of this original system, running at either 6 or 8 MHz (later systems expanded the speed range of the 286 much higher). PC users who wanted more power realized that it was possible to convert the 6 MHz system to 8 MHz by replacing the 6 MHz clock crystal with an 8 MHz one. Like today's overclocking, sometimes this worked, sometimes it didn't, and sometimes it seemed to work but caused "software problems". I have talked with some serious hardware hackers, guys who were building their own PCs from circuit boards before the PC was even a glimmer in IBM's eye. Apparently the Z80 processor was overclocked by some enterprising hardware experimenters back in the 1970s. This was done in a way similarly to how it was done on the 286, by changing the frequency of the oscillator circuit that drove the CPU clock. Overclockers would experiment with tuning and adjusting the oscillator to precisely control the speed of the machine in a way that cannot be done with modern hardware. Modern PCs use neither an adjustable oscillator nor a fixed-speed clock crystal; they employ a precision-controlled, variable-speed clock circuit. A single motherboard can typically run at any of several different speeds, depending on how it is configured. This is probably the key step that really allowed overclocking to become popular, because it became much easier to change the frequency of the motherboard--there was no need to tinker with oscillator circuits, and no specialty hardware knowledge was required to overclock. 3. you can overclock both. Overclocking the system bus is more complicated than overclocking the processor, because it requires special support from the motherboard, and because doing it causes several other components in the system to also be overclocked. As you can see, there are a lot of options with a 150 MHz chip such as this, but it all depends on the motherboard that the system is placed into. For example, most standard Pentium motherboards don't support a 75 MHz bus speed setting; the standard limit is 66 MHz. In addition, some motherboards are limited in the clock multiplier settings they will support. You can't overclock a Pentium 200 to 233 if your motherboard only supports a maximum clock multiplier of 3x. I've given two examples for processor overclocking here; in both cases I consider these overclocking only the processor, because the system bus speed is kept to 66 MHz or less, the traditional standard for Pentium motherboards. The 75x2 situation means that you are overclocking only the system bus (and associated components) while leaving the processor at its nominal 150 MHz. In the last case, both are being overclocked. Of course with a newer 100 MHz motherboard, system bus speeds of up to 100 MHz are officially supported. Microcircuitry engineering is something like cooking: it involves a lot of probabilistcs and will often have rather random results. So, you don't know how good a microchip is until you have fabricated it. Even then, deterioration will have too a bit of probabilistic behavior. - 40ºC (104ºF) or below is heaven for every microchip. - 50ºC (122ºF) is a not bad temperature for any microchip. - Microchips starts getting damaged on its lifetime at 60ºC (140ºF). - - A chip running at 70ºC (158ºF) during 24 hours and 7 days a week, will probably last 2-6 years. - - A chip running at 80ºC (176ºF) during 24 hours and 7 days a week, will probably last 1-3 years. - - A chip running at 90ºC (194ºF) during 24 hours and 7 days a week, will probably last 6-20 months. In this matter there is no difference between main computer chips like GPU, CPU, Northbridge, Southbridge... etc. Given a temperature, it is harder for the chip to maintain it at high processor usage than at low processor usage. For example: a CPU that achieves 70ºC (158ºF) during 10 hours on nearly-inactive Windows desktop suffers less than a(nother) CPU that achieves 70ºC (158ºF) during 10 hours of intensive CPU processing (i.e: SuperPI). Some hardware engineers report this could be due to that in the second case the CPU uses most of the microcircuitry, and in the first case only a small part of it. The general rule: microcircuitry is like an ellectrical printed circuit board that has the tracks very close between them (there are often only 4-5 molecules between two tracks), so heating is slowly melting the tracks as time goes by. Keep things as cold as possible.